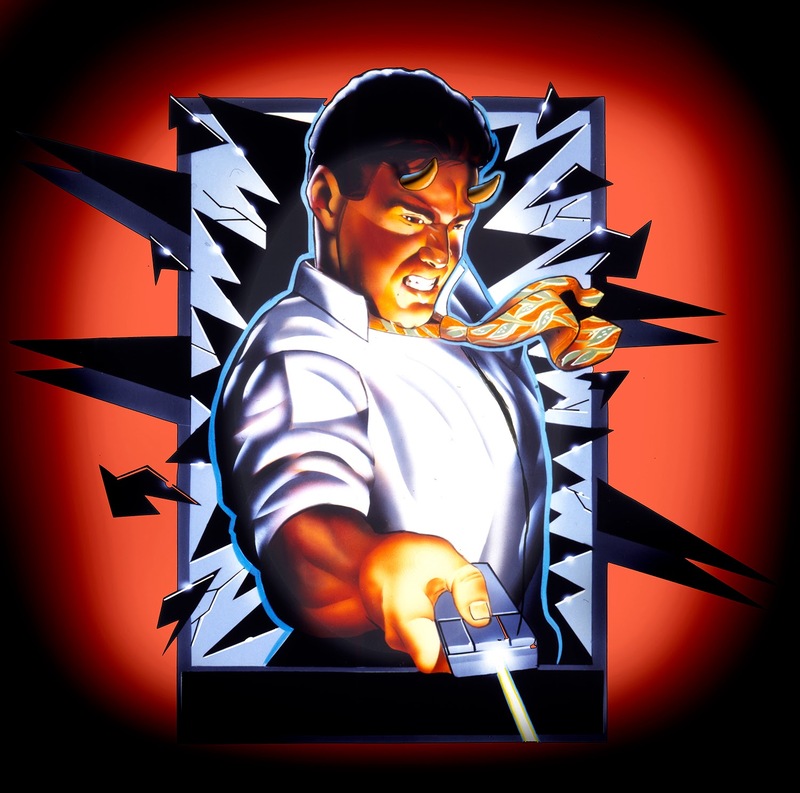 retrogameart.com: THE DEVIL'S IN THE DETAILS, AND A HELL OF A LOT MORE! Take a look !!! THE DEVIL'S IN THE DETAILS, AND A HELL OF A LOT MORE! Take a look !!! DETAIL Has always been a large part of the appeal I tried to put into my Illustrations. I've always been a big believer in giving my viewer a payoff for taking a close look at what I'm presenting, and felt I had a duty to GAMERS to go the extra mile to give them some special eye candy to help their imaginations get into the gameplay. Besides, it was challenging and fun! 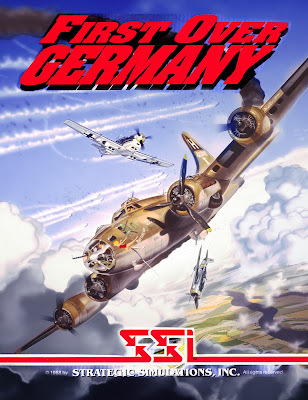 Because this early flight simulator featured one of my favorite aircraft of the Second World War: The Boeing B-17, I felt I demanded an entertaining 'you are there' kind of treatment. I was well aware of the crew dispositions and the type of actions they would be involved with in the course of a bombing mission. I chose a perilous moment for the bomber crew, hammered by enemy fighters as it approaches its IP, or Initial Point, and simultaneously dealing with heavy flak, damaged, and forced to leave the protective fire of its fellow formation members. The pilots are trying to dive away from the formation, in an effort to put out the flames of a shot up Starboard engine and a dead feathered Port engine. 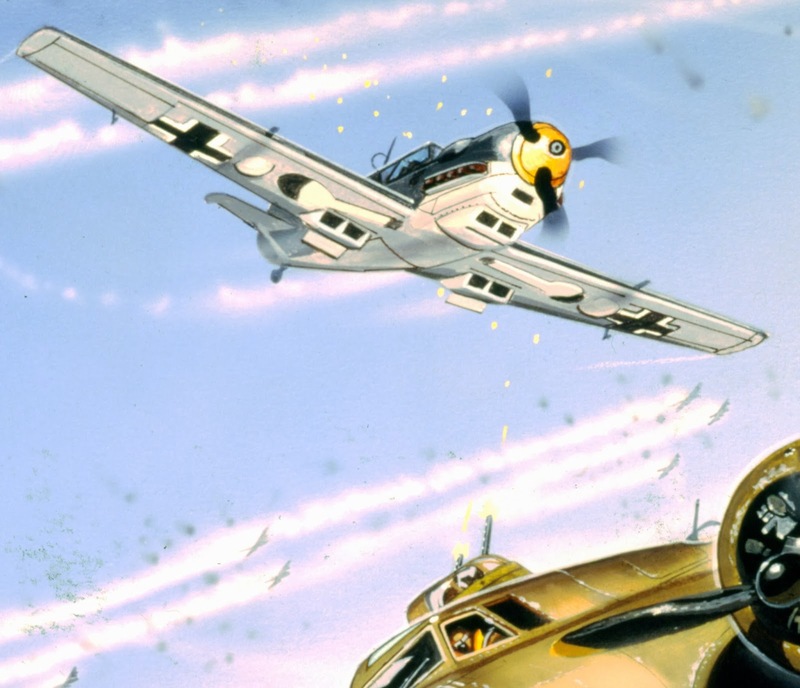 An BF-109, and a FW-190 immediately jump the crippled bomber, and take fire from the belly turret and the top turret as they make their dangerous passes. German Interceptor pilots had a phrase for making a pass at a B-17: They called it "Like flying into a barn door." .50 Cal. and is scanning the sky for targets, and the Belly turret is spitting out its spent brass casings as the gunner tries to track the Focke Wulf below. The Pilots are obviously busy trying to keep the aircraft in trim while the top turret gunner peppers the Messerschmidt passing overhead with a combined transverse closing speed of maybe 600 MPH. I can tell you that this is what tracers looked like to these men, floating glistening into space like beads of water catching the sun out of the nozzle of a hose... until one slammed into your airframe, OR WORSE, YOUR BODY. 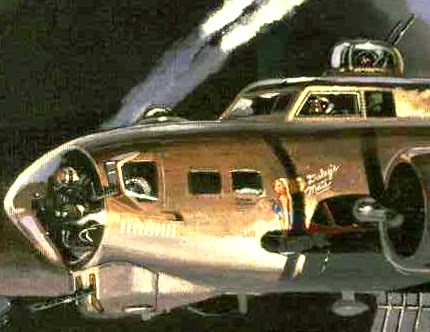 The German fighters were firing 20 mm cannons (The nose cone barrel is visible at the center of the BF-109 propeller boss) through the aluminum skins of these B-17s, set to detonate a microsecond after hitting anything, they exploded into the crewmembers, cutting control cables, oxygen lines, and critical equipment, all in the freezing thin air 3 miles up. 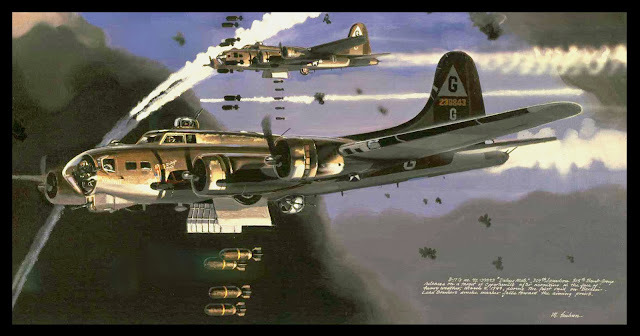 'Daley's Mate' of the 305th Bomb Group, dropping her ordinance on a target of opportunity during the initial offensives against Berlin in 1944. The Tailing white smoke marker was dropped by the lead bombardier to signal for all aircraft in the group to drop at once. This group would lose 768 aviators of all ratings killed in action, and over 900 interned as captives. You can see the details of the crew again here, although the nature of working in oils as opposed to airbrush can be readily seen. 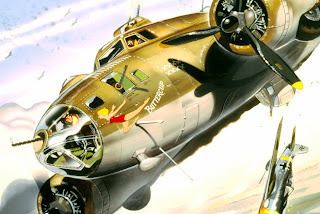 The 'G' Model of the B-17 was the first to feature the forward facing remotely controlled chin turret, developed to counter the Luftwaffe fighters' favorite tactic of attacking these bombers head on, which was very effective, as you might imagine. I wanted the Courage of these men recognized, and that's where and why these details mattered to me. 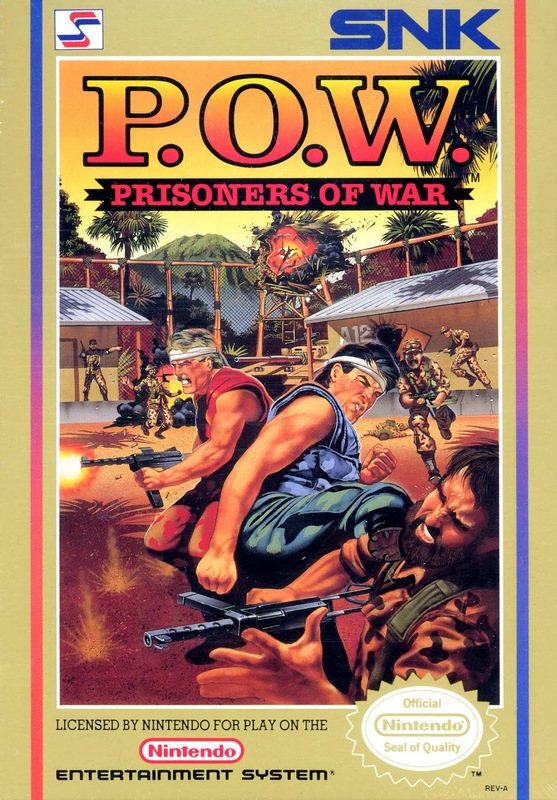 was 1989's SNK's P.O.W. PRISONERS of WAR: My thought on this game, as a sister game to the SNK's GUERRILLA WAR was less realism, simply a wild eyed shoot 'em up, wherein a crazy break-out scene would really get the gamer excited. 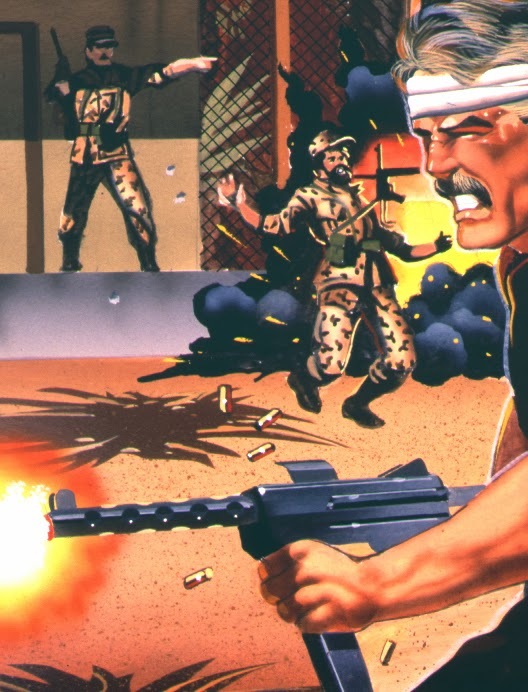 My two captured Good Guy Prisoners of War have somehow snatched a submachine gun, and are using their prodigious karate skills to overwhelm their guards, while in the rear, more guards come boiling out of the woodwork, directed by an enemy officer, at the left rear. A tank squats menacingly around the corner of Bldg. A12, while two detonations take out the Tower and a middle ground bad guy in the exercise yard. Might our boys be overwhelmed by the Fidelistas? Will they have the ammo necessary to make it to freedom??!! Dude, it's a VIDEO GAME!!! 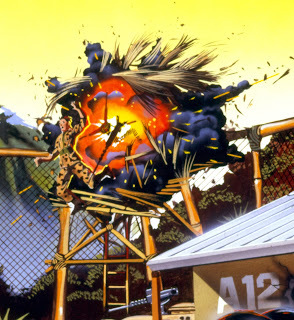 You can see the detail I put into the Detonation in the guard tower/ machine-gun nest: The guard is seen doing the classic windmilling arms stuntman fall, while the .50 caliber M-1 heavy machinegun is blown to the ground, as the Banana Rebublic palm frond stronghold is blasted to smithereens. The enemy commander is leisurely directing his troops to capture the pesky Americanos, while being careful not to put himself at risk, while our Heroes blow and blast their way to freedom, amidst the flying shrapnel and tumbling hot brass, spewing from the receivers of their wildly firing submachine guns. AS ALWAYS, Thanks so much for dropping by, and keep your muzzle down and your ammo dry! !